This particular series has a blue dye added to the right side of the bill. The bust on the side is a representation of Liberty. 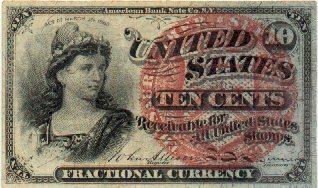 The US made this type of ten cent bill from 1863 to 1867. There is no date on the bill itself. This particular bill is from the second issue of the series.